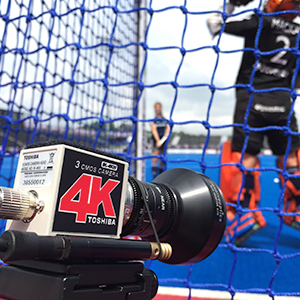 Camera Corps asked Polecam to help with its supply of cameras to the Champions of Hockey Games at the Olympic Hockey Park in London, England during June 2016, a 14 camera OB with Timeline and BT Sport. Due to the need for miniaturisation and a low profile look, 5 x Toshiba IK-4K minicams were put in as Nectams, Goalcams and a Judgecam with all cameras being controlled from a single RCP. These cameras were fitted with the new UHD Fujinon 4mm TF4-XA1 lens as well as the unique Polecam 0.7x wide angle adapter making the 4mm lens into a much needed 2.8mm lens. Both these lenses are UHD and a vast improvement on the predecessor to this lens increasing the quality from 70lp/mm to 300lp/mm. Steve Giles, Marek Jamroz, John Gillan and Steffan Hewitt all provided Polecam Operator services during the two and a half weeks. All operators were wearing full 'goalie-style' protective gear including helmets which gave restricted vision. Normal headsets could not be worn as the helmet restricted their use too. Earpieces had to be used with remote mics. Dave Sisson of Camera Corps was key and vital in the first few days of rigging. The Toshiba IK-4K camera provides a 50P signal made up of 4 x 3G-SDI signals. With the need for data as well, MiBroadcast provided 3 x custom made 4K fibre systems in throw-down Pelicases. The Polecams also required return video signals so MiBroadcast provided 2 x modified Telecast Copperhead Systems which also provided power down the SMPTE cable making life much simpler and safer behind the goals. Andy Oram, Head of TV and Broadcast at the FIH (Federation of International Hockey) said this of the BT Sport production - "Absolutely brilliant coverage but most of all you have brought a personal touch to Hockey that has never been done before. I cannot thank you enough for all the energy you have put into the coverage over the past week. I know there is another long week ahead but please know that everything is truly appreciated and the international viewing figures and viewing durations are reflecting all your hard work." The ease and speed with which the Polecams can be relocated offering high behind shots above the goal and players out of the tunnel, national anthems, crowd shots, ceremonies and beauty shots. "This is the real key to the Polecams and the Toshiba 4K minicams. Highly portable, un-obtrusive and great quality images," said Steffan Hewitt of Polecam. "This was challenging and ground breaking coverage and the flexibility of the Polecam made it a very cost effective tool. Initially the requirement was for 8m long Polecams but due to the restrictive space behind the goals these were quickly shortened to 3.5m making them much more versatile."